It has been an absolute crazy year and half since my first son Trevor got married. At that time, I was married, (barely), living in another house (barely), hanging by a thread (barely) and still determined to enjoy every bit of that wedding. And I did. 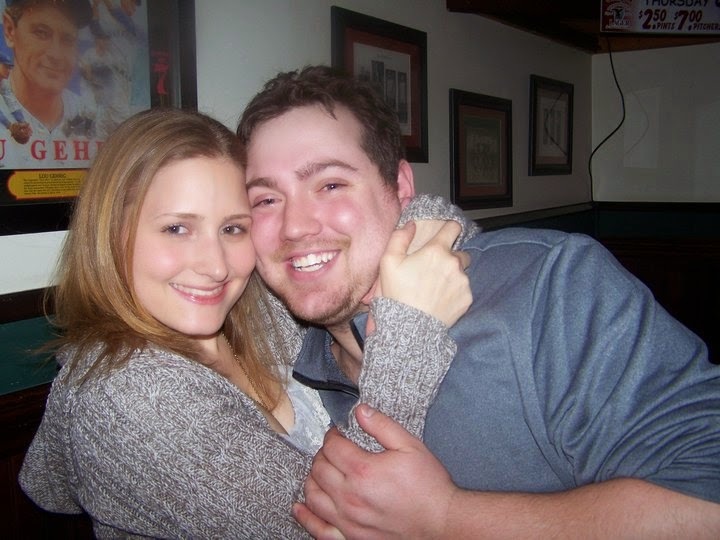 Now, my youngest son, (please don't kill me Kyle) my baby, is getting married. When the boys were little, he was the one who always found my hand in a crowd. And now, he's found someone else's, and I couldn't be happier. And if you think for one moment that I can use my previous "mother of the groom" experience for this wedding...you would be wrong. There is nothing traditional about this couple. They live to entertain. Just weeks before I purchased my place, they purchased their new home not 15 minutes from me. Most weekends find it filled with friends or family, food and firewood (fireplace or fire pit, time of year doesn't matter much to them) as long as it's a gathering. I love them for that. With that said, their similarities are less then you might think. But first, let me get back to the beginning. 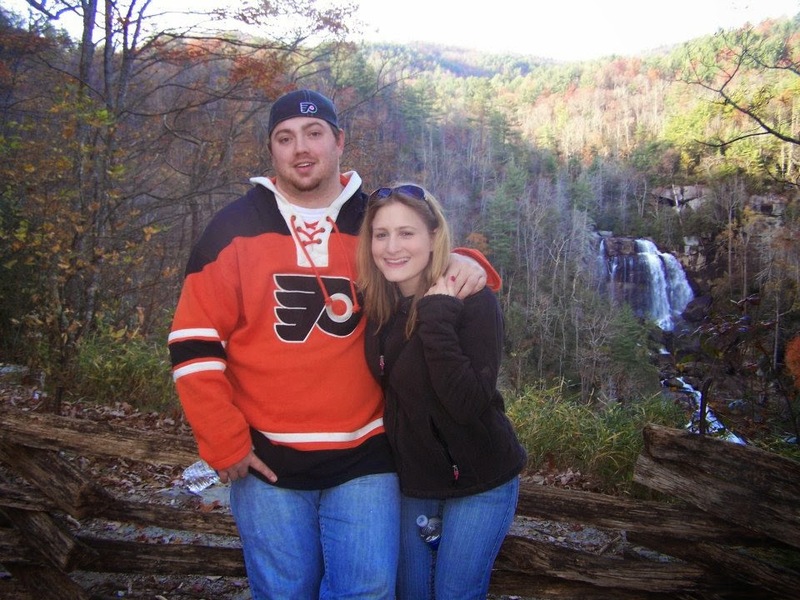 They met at a hospital where Kyle, a recent culinary school graduate was the lead chef and Melissa was a food runner putting herself through Rutgers University to become a registered dietitian. Kyle is funny and loaded with charisma. Melissa is full of life and ready to enjoy it. This was a perfect pairing and it was on! One of my favorite pictures of them! Since Melissa commuted to school daily by a train close to our house, many nights during the week, she would stay over with us. She quickly became part of the family. I can still see her sitting at the table doing homework, just as my guys had done years before. Sometimes we would sit at the kitchen island and talk for hours. I loved that she always noticed my holiday decorations days before any of the men. But the best part is, I got to witness a closeup of the interaction between the two of them. Not something a Mom always gets to observe. Kyle always fed her need to be organize with his desire not to be. She kept a journal of her activities and plans for several months out. Even her future oil changes were estimated in. She cleaned his room and organized his closet, even putting yellow post its up on his mirror with reminders of their activities. My (then) husband and I would quietly laugh in our room as we would hear him mumble as he pulled a new one down, "what the hell is this now." On his part, and I'm not sure if its his 6'3" large frame that makes him feel so protective of her 5'2" well-toned form, (the result of being a work out fanatic), but he is. He told me once that it is her nature to try and please everyone and the result can sometimes lead to people taking advantage of her. She doesn't always see it, he explained, and it bothers him. He encourages her to take firmer stands when someone is pulling her in a direction she really doesn't want to go. Maybe with someone permanently at your side, it's easier to hold your stand. He cooks, she balances meals with healthy salads. (Even if we order a pizza she makes a salad to go with it).She likes working out, hiking and camping, he likes golfing, fantasy football and anything but camping. But somehow, it all works. They balance each other so well. He knows her fondness of the outdoors, and one late autumn day, offered to take a walk in the woods with her. When it was over, he dropped to his knee and proposed. Simple and classic. These two are the least pretentious people I know. Nothing has to be fancy or forced. They thrive in their home when family and friends are surrounding them. 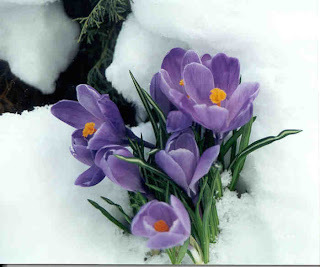 I know this wedding venue will take place in a natural setting, relaxed, informal and fun. And here's a point to prove that. Just the other night, my two boys, two girls and sister came to dinner to start planning the wedding and the baby shower that is the result of the first time I was the mother of the groom! Anyway, as they were leaving, Trevor was showing me his new car which has a rear view camera for backing up. Kyle yells, "Hey Mom, get in and try the camera!." So I did. Slipped in, put my foot on the brake, the car in reverse, and looked down at the screen. There, in all it's glory, was a "full moon" provided to me by my son Kyle! I couldn't see his face, but I knew who it was. The four of them were laughing hard as I was screaming "KYLE" into my otherwise quiet neighborhood. I posted the incident on Facebook and got 18 comments that basically said the same thing "that is so Kyle! ", and it is. My real problem is a comment that I heard him say as I was getting out of the car to come around and smack his arm. "Mom, just think how much fun the wedding is going to be." End of Part I "After mastering all of the other projects in my house, this tiny one was shaking my confidence (along with my right arm for several hours.) I actually spent the afternoon drilling one hole. ONE HOLE. There were 24 more to go. What was I doing wrong?" Part II Where do I go from here? I was truly frustrated and hurting. At this point, there was only one thing that made sense. Okay, two things. Take a walk, return, and have a glass of wine. Those two always give me some perspective. Maybe it's the female version of a man grabbing a beer from his garage refrigerator, sitting on a metal stool and cursing. Once calm, I was going with the theory that it was the drill's fault. When I first bought my place, I went out and purchased some tools. Cheap tools. At the time I was thinking, "why would you pay $99 for a drill, when you can get a perfectly good one for $35? Apparently there is a reason. I saved and paid over $200 for a Le Cruset dutch oven because of it's quality. Are tools any different? No. So after researching the internet, I found my solution and went shopping. It was truly a game changer. First of all, when some men are talking about T & A, they may be referring to torque and amps (which really means thrust and power), okay, maybe it does sound the same. But seriously, it's all the difference when it comes to drills. The higher the torque and amp rating, the better the performance . Amps being the most important. My $35 drill had 6 amps, my new one has 8. In my research, I also learned that, while being a pound heavier, electric drills, because or their T & A, are easier for woman to use because they require less pressure...i.e. less shoulder pain! I was amazed at what I was reading. It was also in my mind that when I watched the Rehab Addict on HGTV, host Nicole Curtis (tiny, thin, blond with well toned arms) uses a DeWalt drill. So off the store I went. Now, I am the "Norm" at Home Depot where everybody knows my name. Clerks in the isles feel the need to rescue me when I start staring at tools. "JP, what brings you in again?" But today, I knew exactly what I wanted. "I want a DeWalt, corded drill with at least 8 amps." 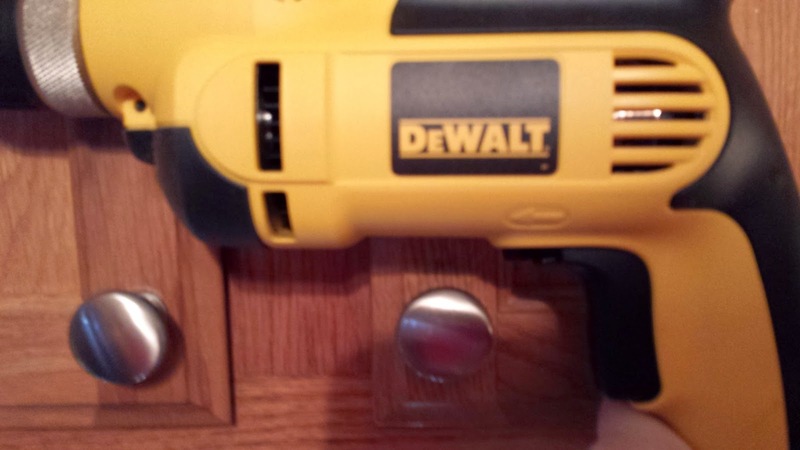 He looked down his crinkled nose, "do you mean a cordless drill?" By now I had grabbed the yellow box. "Nope. I want this one." He shrugged "okay, what are you doing anyway?" "I'm trying to install door hardware on my kitchen cabinets." "Ooooh, that can be difficult", he added. "Are you using a brad bit?" "A what bit?" I asked. "A brad bit. It's for wood. Has a little point on the end. Makes perfect holes." So, I headed home with an 8 amp DeWalt corded drill and a package of 3/16" titanium brad wood bits! The result? The new drill put the new bit through the cabinets like butter. I had the whole kitchen done in less than 30 minutes!! This shouldn't be so hard! It shouldn't take anger, pain, and hours of research for a woman to do a simple task! With the divorce rate (sadly) at 50% plus, there are many smart, single women out there that need to know the landscape of what was typically a man's world. We can do this! With that said, I am making a pitch...a plea really, to Lowe's, Home Depot, Ace Hardware and all other home improvement stores to think outside the box. Start a "Girls Home Repair Night" on Fridays. 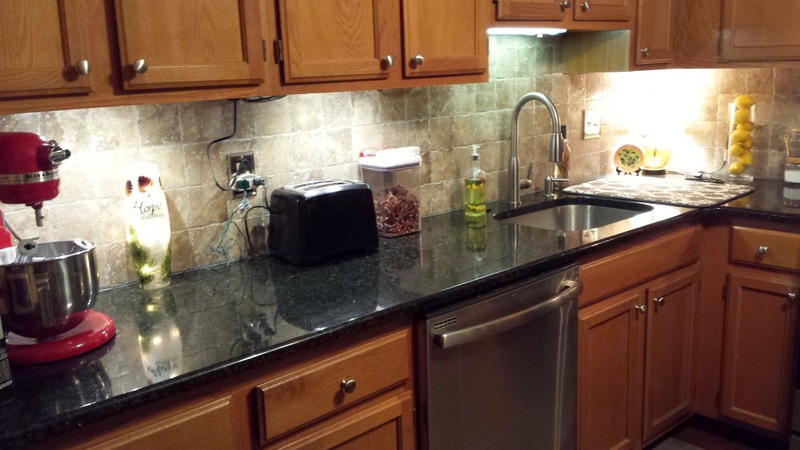 Set up work stations with drills, saws, plumbing tools, electrical switches and outlets. Anything that would help us keep our houses functioning without calling expensive contractors for every little thing. I promise you, a packed house. In return, you would have knowledgeable, loyal, customers. A whole new breed of shoppers in your stores. If possible, find handy women (like myself) to teach the classes. Women on a mission to learn and spend. How bad can that be for your business? PS. Best to serve wine and cheese as refreshments. After all, we're not animals. Installed evenly with a piece of cardboard! Recently, I stood at my living room window watching a contractor across the way replace some deck posts that I guess had weakened over time. I watched with interest as he unloaded his tools, lined up lumber and grabbed the tape measure from his belt. Here is where it got interesting to me. He measured, made a mark, and measured again...and again. "Measure twice, cut once" is a well known term among tradesmen, but six times seemed excessive. Now, I've witnessed this repetitive action before with other contractors and my ex, but this time, I became convinced that men are either obsessed with measuring things, or, have a real problem with short term memory loss. In any event, my real reason for the persistent observation was to see what drill he would be using. But his damn tape measure was holding up that part of the job! Let's start from the beginning. A couple of years ago, a friends husband was renovating their already large kitchen, when he decided to remove some cabinets and take a wall down. Short of it is that he had a full box of new cabinet knobs that he didn't use or return. So when I started renovating my kitchen, he gave me a box of new, polished silver knobs that went well with my new stainless steel appliances. If you've ever purchased cabinet door hardware, you know that it can be expensive. Sometimes, $4, $5, $6 (or higher) each. I needed 25 knobs. So even though I had my eye on something a little more upscale, free was cheaper. And it would look fine. One of the things I didn't change when I renovated the kitchen were my cabinets. I may paint them at some point, but for now they are in good shape. They didn't have door knobs before, so there were no pre-drilled holes. So one cold winter day with nothing much going on, I decided to tackle the job of installing the knobs. How hard could it be? That will be the last time I ask that question. My first concern was making sure that all the knobs lined up evenly on each door and drawer. As you knew I would, I went to YouTube to see how exactly this is done. After several videos on the correct use of protractors and other measuring devices, I finally said "screw this" (no pun intended) and tore the cardboard backing from my grocery pad and made a template. It worked perfectly! Onto the next step, drilling holes for the knob screws. Using my handy dandy template, I marked up all the cabinets and was ready to commence drilling. I figured all 25 holes would take about 30 minutes. I figured wrong. I had no idea how hard cabinet wood is. At least my cabinets anyway. (I should stop here and tell you that I have a torn rotator cuff in my right shoulder. It only bothers me when I'm doing something really stupid. Now let's get back to my story about doing something really stupid). So, I find 3/16" drill bit, which is what is suggested to use, take aim and pull the trigger, and went absolutely nowhere. After several minutes, there was just a tiny hole in the wood and smoke was pouring out of it. 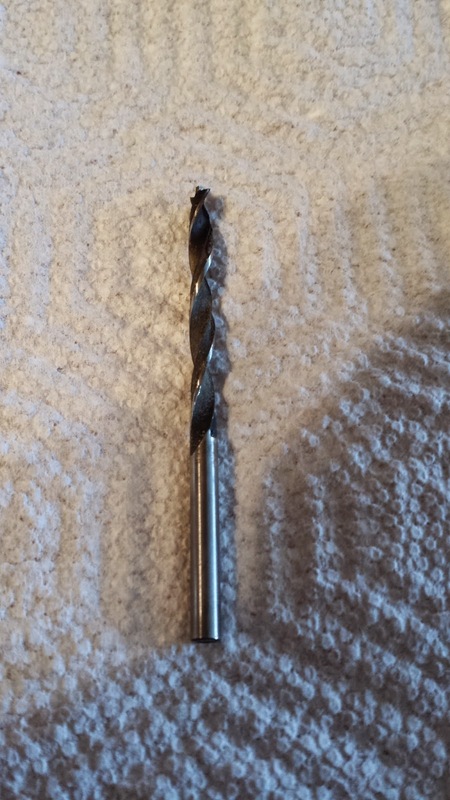 I pulled the drill bit back and the tip was black...burnt black. 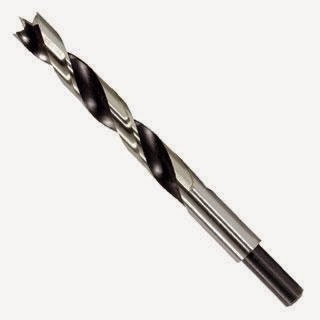 Remembering something I read recently, I switched drill bits to use ones made of titanium. TITANIUM. Used in the assembly of commercial air crafts. I better be careful not to go through the wall and into my neighbors kitchen! This should work much better...and it did. Not. Although, there was a lot more smoke coming out. After several minutes of applying intense pressure, I broke through the wood and a hole was born, but my shoulder was killing me and the kitchen smelled like a wood burning fireplace. This can't be good...or normal. I put all my tools on the dining room table and then reached for the Advil. After mastering all the other projects in my house, this tiny one was shaking my confidence (along with my right arm for several hours.) I actually spent the afternoon drilling one hole. ONE HOLE. There were 24 more left to go. What was I doing wrong? Winter's Best Friend...The Crock Pot! Every once in awhile, I stumble on something that just blows me away, Something so simple and delicious, I question why it took so long to make after finding the recipe several months ago. Especially since now it is winter, and who doesn't like coming home to a warm meal, simmering in the kitchen...waiting for you. Bring out the crock pot! It was made for cold winter days. Rainy days, snowy days, it doesn't matter. This is the go to appliance to meets you with a meal at the end of a long day. Let's sum this up. The crock pot is like the kitchen's version of an ATM. As long as you put something into it, you can easily make a withdraw after a long hard day. Crock Pots have been around for years, and have certainly improved with age. They now have more options like programmed timers making it easier to adjust the settings to prevent over cooking. So, without further adieu, here is the knock your socks off pork chop recipe that I promised and a few other ones too! 1-1 1/2 cups of water. If not using a Crock Pot insert bag, spray the interior with vegetable oil spray. Mix the soup, water, ranch dressing and garlic powder a in a bowl. Whisk ingredients well and pour a little in bottom of the pot. Then layer the pork chops and cover with remaining mixture. 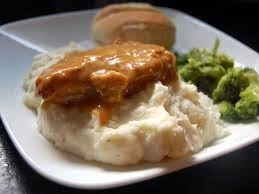 The gravy it produces is incredible on noodles or mash potatoes! Cook on low for 6 hrs or high for 4 hrs. Ta Da! Now, I imagine this would work with boneless, skinless chicken breast too, But the pork chops just add a really good flavor. 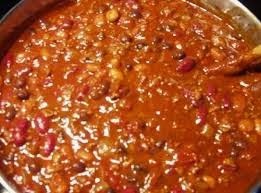 With NFL playoffs, and the Super Bowl looming, every cook will find a way to make a great chili for their gatherings. With me, it's all about flavor and ease, both of which are found in this long family favorite! That’s it! Saute the garlic in a little oil, add and brown the meat then mix in the chili seasoning. Drain the meat mixture and put in the crock pot with all the other ingredients and let simmer for at least an hour, or four or five, if time allows. It is also a great stove top chili recipe as well. Assemble the same way and let is simmer for at least an hour. The salsa really does all the work in the flavoring department here. I usually serve it with a loaf of crusty bread, but for parties (Super Bowl? ), it is great to put out with scoopable (spellcheck is having a fit with this word, but you know what I mean) Tostito chips with a side of sour cream! Now for those still holding on to resolutions for a healthier New Year, here is another use for the crock pot this winter. 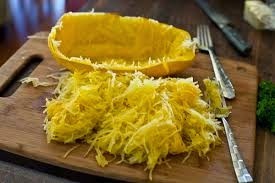 Spaghetti Squash!!! Just thoroughly wash one large squash (or two small ones), pierce each one 4 or 5 times with a sharp knife. Place inside crock pot on High for 4 hours or Low for 6 hours. Be careful removing it from the pot, it will be soft and hot, but otherwise, it comes out perfect every time! 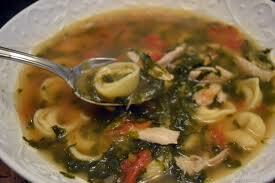 Last Year's Most Downloaded Soup Recipe! Note: Looking back over 2014 blog posts, when it came to recipes, this was the most downloaded. It still remains at the top of the "hit" list each week. It is simple and delicious. So, if you missed it, here it is one more time! Enjoy! Kitchen Clatter will be back next week with a whole new year of adventures! He just won't let go. As I write this, Old Man Winter is pointing his icy finger in our direction again with another week of cold temperatures and the possibility of a winter storm, which is ironic since it is SPRING! We should be planning our outdoor recipes but instead the grill remains covered and the patio furniture snugly locked away. With that in mind, we will offer up one more Saturday soup that is actually light enough to serve in the warmer months and healthy enough to eat year round! I call this "almost" home made soup because you can easily use store bought broth since such flavor is added, no one would know the difference. It also takes such little time to make, you won't need a pot simmering on the stove all afternoon. I don't know where this recipe came from since it is written on fading piece of paper and stuffed in my recipe folder. But I know it quickly became a family favorite, and the time this was deemed "heart healthy" and one look at the ingredients will explain why. Saute the minced garlic slowly in the olive oil so as not to burn (I've done this, and there is no way to fix burnt garlic - so nice and slow!) Add the wine. Once the steam cooks off the alcohol, add the can of diced tomatoes and let simmer for about 20 minutes on very low setting. Now add both cans of the chicken broth. Once this mixture is bubbling, add the bag of baby spinach. Now you have something really wonderful cooking! The last step is strictly personal preference. I boil water in a separate sauce pan to cook the tortellini's in. You could add it directly to the broth to, but I don't like all the starch that it adds so I cook and drain separately, so the pasta doesn't become a thickening agent in the soup. I do this with all soups that require some type of pasta because it is the way I prefer it. Make it the way that you would like it. After I drain the pasta, I add it to the simmering sauce and "boom", you have the tastiest, quickest, almost homemade soup you can make. With the spinach, the garlic, the white wine and olive oil, I call it my "Heart Healthy Tortellini Soup", but you can call it anything you want. Add a loaf of good crusty bread and you have a meal! Left over chicken? Dice and throw it in! !